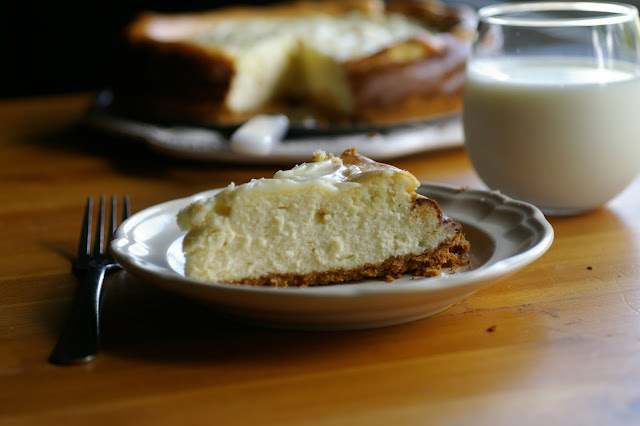 This Cheesecake is creamy and full of flavor. I love mine plane Jane but you could put a topping on it if you like. I made cheesecake the other day. It has been a while since I made it. My daughter requested it. She recently graduated from St. Pius X Catholic School. She is now off to high school. My monkey girl sure is growing up fast. For her 8th grade graduation, she didn’t want a store bought cake.Nope, she wanted mommy to make her a homemade cheesecake. So when I made this, the direction didn’t require a water bath. So, to make a long story short, it cracked. I mean San Andreas fault cracked. So I thought about putting a topping on it to hide it. Nope, monkey girl does not like toppings on her cheesecake. What monkey girl does like is chocolate. So in the freezer was a half open bag of white chocolate. I melted it with some cream.You know, to make a ganache. I poured it over the top and it covered the cracks. It was so good, I think I may make it like this from now on, with or without the cracks. Preheat the oven to 350 degrees. Mix together graham cracker, sugar and margarine. Press into a 9 inch spring form pan. Bake for 10 minutes. With your stand mixer, beat cream cheese, sugar and flour, mixing at medium speed until well blended. Add eggs and mix well. Blend in sour cream and vanilla. Pour over crust and bake for 1 hour and 10 minutes. When cool, loosen cake from rim of pan. Chill until ready to serve. I would love to try a piece of this scrumptious cheesecake! We are huge cheesecake lovers around here. It is Alex’s favorite dessert. Love the white chocolate ganache on top. That was pure genius right there. Hey, even when you do a water bath, you get cracks..lol. This is perfect!! This cheesecake is just lovely! 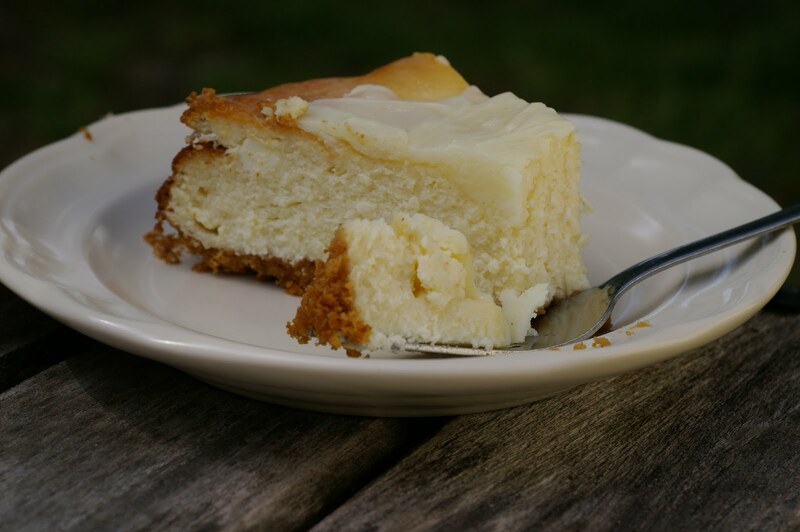 Our church had a cake contest last weekend and the winner of the teenage baking competition made a cheesecake with white chocolate drizzle … it was so delicious! i can just imagine your Monkey Girl loving your gift to her! The photos in this post rock too! love the very first one! Come link it up to Made it on Monday, a weekly recipe link I host on my blog. Congrats to your daughter! How flattering that she’d rather have your dessert than a bakery cake! This cheesecake looks fabulous…especially with your white chocolate ganache…mmmmmmmm. 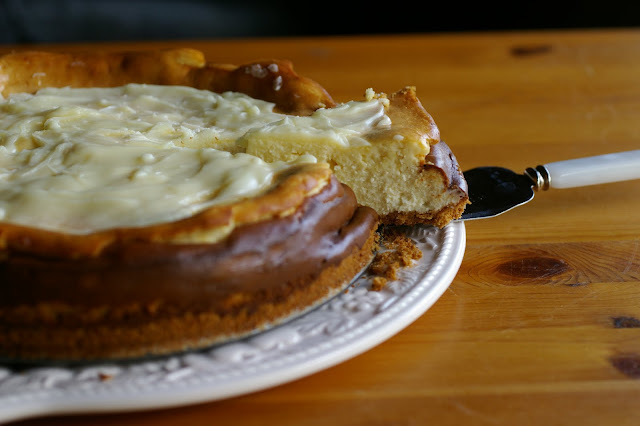 This looks like a wonderful cheesecake…and I think it was extremely creative to spackle the cracks with white chocolate ganache mmmmmmmmm! Beautiful pics. An excellent and very delicious solution to the San Andreas fault problem! Your daughter knows what she likes!! I would also request this cheesecake from you…it looks crazy-delicious! I love the ganache! So tasty. I use chocolate and caramel when my cheesecakes get uppity and crack on me. 😉 White chocolate is an excellent idea I’ll have to remember for next time. Yummy cheesecake for a very special occasion. The white chocolate is perfect on top. What a great idea! Some of the best recipes come from near disasters! Congrats on the new high schooler as well! I tell ya – that is one precious girl! AND that is what Jesus does best (just as you – mama, did!) filled in the cracks and made us/it beautiful!! God bless and thank you for your writing.